Pack your bags, saddle up and get ready for an amazing adventure you’ll never forget. 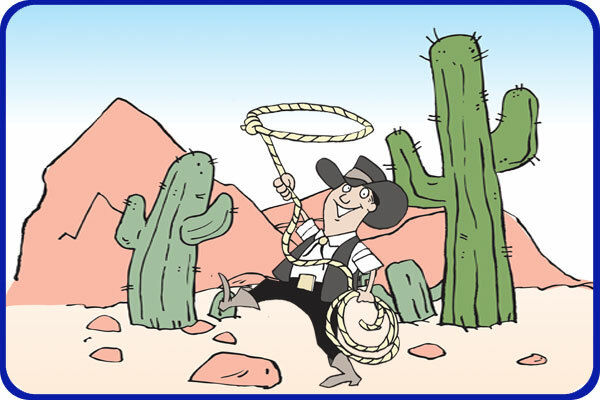 Come ride with Cowboy Steve and his friends as they take your students on a new reading and tumbleweed adventure. During the program students will discover a passport to reading, visiting places like China, Egypt, Italy, India and even the wild west of Dodge City, Kansas. Like all of his programs, this show includes costuming, puppets, magic, music, audience participation and a strong message about using library resources! 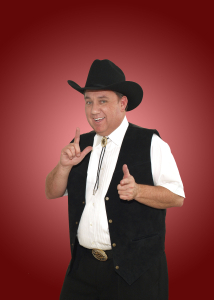 This time, Cowboy Steve and the students at your school will discover some of the secrets to a great story. In particular, they may learn about descriptive language, character development, plot twists and other writing tools. To help students understand the elements of a good story, we will be looking at lots of books including award winners, books that have been made into movies, classic children’s books and folk tales from across this great land of ours. Filled with book talks, storytelling, and a neat moral at the end of the show, this program drives home the importance of reading good writing. Throughout the 45-50 minute presentation Steve uses the “Storie-O-meter 5000” to find books and stories that set the stage for learning and fun. Special guest, Petie, the Opossum (a puppet) interrupts the show while engaging students with concepts like: omnivore, marsupial, nocturnal and much more. Kazzam, an East Indian Spitting Viper Cobra (not really) makes a surprise appearance while helping one unsuspecting audience member perform an amazing trick. 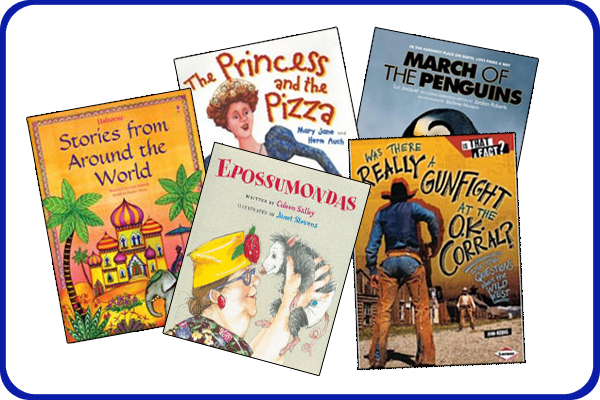 The Saddle Up ‘N’ Read show includes a fascinating collection of stories from all around the world. Tales of brave heroes and heroines are retold alongside magical stories of talking animals and enchanted lands. The show describes elements of great stories including both fiction and non-fiction examples! Watch and listen to The Blue Bandanna, an original melodrama from the Old West. Mean villain, Bad Bart, steals a necklace from the beautiful Gracie Pearl. He ties her to the railroad tracks and disappears. But wait, could it be? Yes . . .it is none other than Texas Ranger: Justin Tyme. Will he save the day? Saddle Up 'N' Read is a great show anytime reading is the focus! Giddy up and book the Saddle Up show now! Are you still wondering if you should schedule an Amazing Teacher program? Here are some additional clues to the quality programs we offer . . .but don’t just take our word for it . . .look what educators are saying about our shows! We guarantee that our programs are engaging, entertaining and maintain the highest standards of educational significance. Each show has been developed to inspire students to succeed. If you are not satisfied for any reason, then you do not pay. That is our word and promise. Schedule any Amazing Teacher show at your school and get TWO presenations of the show for the price of one. On the day of your scheduled event, Steve will bring customized full-color bookmarks for every person attending the show. These bookmarks contain "magic numbers" (the Dewey Decimal numbers) to help young readers find books at the Library. An author of five children's books, Steve donates a signed copy of one of his books to the library the day of his visit. Time permitting, Steve is happy to visit one or more classrooms the day of the show. These visits may include short book talks, a personal introduction to Hopper the Magic Rabbit, Questions and Answers, or even learning a simple magic trick! When time and technology permit, Steve is happy to host a LIVE Skype session. This 20-30 minute visit (at least a week before the show) will help build excitment and include some special surprises. Schools are invited to record the event and replay it as needed. Each show is both entertaining and educational. Steve works hard to incorporate statewide learning objectives pertinent to the show topic. After an Amazing Teacher program the books in your library will seem to disappear off the shelves. When students get excited about reading the circulation of books will always increase! Time permitting, Steve is happy to turn your event into an Amazing Author Visit. Steve has written five books related to magic tricks, science, puzzles, optical illusions, and more. He enjoys the opportunity to share his experiences with writing, editing, and publishing. Book Sales are required. Every show we produce is developed by teachers. Combined total, our program specialists, have more than 100 years of educational experience. This background guarantees a quality educational presentation. 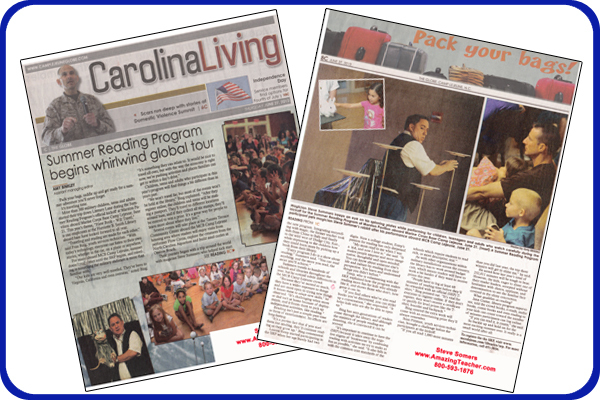 Once you schedule an Amazing Teacher program, you will receive several helpful resources, including large full-color posters promoting the reading show you selected! Most all of our programs include a variety of classroom resources. Everything from student worksheets, enrichment activities, teacher guides, and more. Share the Day and SAVE! When you schedule a half-day (1-2 presentations), pass the word along to your colleagues. If they opt to share the other half of the day or evening, you both can save money. Early Bird and VIP Discounts! Each year we offer opportunities to get Early Bird or Fast Action discounts for any Amazing Teacher show. In addition, once you have scheduled the Amazing Teacher, you become a VIP and are entitled to special pricing deals and VIP treatment on all future bookings. When you schedule an Amazing Teacher show, there is NO Deposit, NO Obligation and NO Risk. If you need to change dates, change shows or even cancel the event until next year - NO problem! Our aim is to be the easiest and most flexible performer you have ever booked. From the first call or email to book the show until the follow-up survey after the show, Steve is available to answer questions, offer suggestions and serve you and your event. Just let him know how he can help! Steve brings all the equipment necessary to make your event a success: including a theatrical backdrop, a professional PA system, a custom collection of props, puppets, and much more! All you provide is a place to perform and an audience. We Make You the Star!! Students, teachers and parents will be genuinely appreciative for your skills as hosting a great event. As coordinator for the Amazing Teacher event, you will become the star for weeks to come. When you schedule an Amazing Teacher show, we will be with you every step of the way. Steve will stay in touch by phone and email to make sure your event is worry free! You can depend on Amazing Teacher to be there, on time and ready to deliver an exciting program!